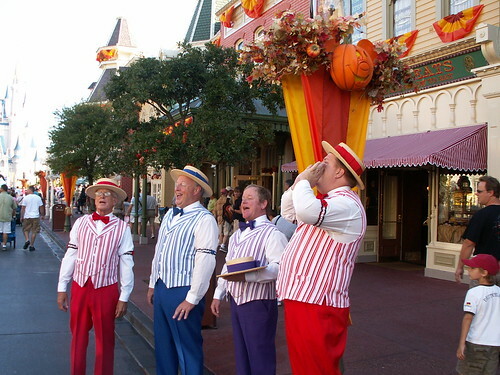 For the morning ceremonies at the TTC (Ticket and Transportation Center) , crossing the Seven Seas Lagoon, and a set by the Dapper Dans, to open the sound file now, you can click on the following link OR right-click on the link and choose SAVE TARGET AS to save the file to your hard drive. For the second set by the Tuners, and Piano Man Jims first set, to open the sound file now, you can click on the following link OR right-click on the link and choose SAVE TARGET AS to save the file to your hard drive. For the Notorious Banjo Brothers and Bobs set, to open the sound file now, you can click on the following link OR right-click on the link and choose SAVE TARGET AS to save the file to your hard drive. With the coming of digital photography I have become increasingly sensitive to the constructive criticism that some trip reports just have too many pictures, and none of the bad ones are weeded out, that said I realize there are folks who also take the "more pictures the better" attitude, so I'm going to do TWO trip reports for this trip. One version of the TR will be one page per day of the trip with just 20 pictures for the whole day all on that one page that said there is still the editorial decision as to WHICH 20 photos to feature, and I'll just have to take my beast guess as to which ones I think are the best, or best illustrate the report. The other version with as many pages as it takes for all the pictures (at around 30 photos per page). Both reports will have identical text, Since this is the first page of the "limited version" of the trip report here is a link to the first page of the "all the photos" version of the report for those who prefer that. 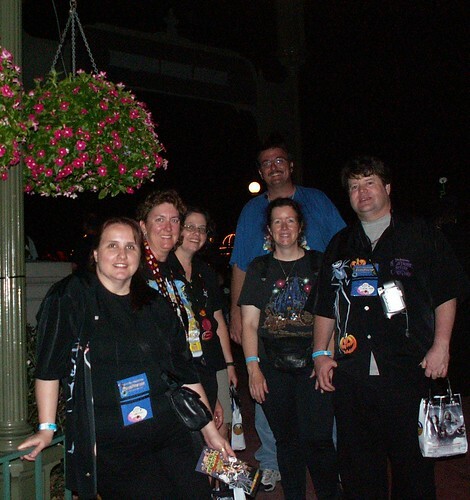 The first day of RADP October trip in 2007, arriving after an overnight drive from Charlotte NC the wife dropped me off at the Magic Kingdom where I had the whole day to myself before the first RADP meet that evening for the fireworks at the Mickeys Not So Scary Halloween Party ( MNSSHP ). That said it was a bit of a long day and I was a bit wore out for part of the evenings festivities, after sitting out the parade at the Rose Gardens structure (former load structure of the Swan Boats)I met up with some RADPers for the fireworks, before making one last attempt at catching some of the live entertainers I had been looking for all evening. After the overnight drive to WDW my wife dropped me at the Magic Kingdoms "guest Drop off" which is also the Taxi stand and is located between the Ticket and Transportation Center (Ticket and Transportation Center), Polynesian Village Resort, and the Parking lot it is on the same road as the Kennel for the Magic Kingdom. I arrived at the Ticket and Transportation Center WELL before opening so I grabbed a bench and wrote a few postcards to friends. Even though they weren't letting off-site day guests into the interior of the Ticket and Transportation Center courtyard until just before park opening, when I approached the gate and asked where the nearest restroom was they pointed me to the one inside the gates, which I thought was a very nice and reasonable thing to do. I recent years I've become interested in many somewhat esoteric aspects and details of Walt Disney World and one of those aspects are its bathrooms, so I took the early morning empty bathroom as an opportunity to snap some photos. Much like many of the older restrooms in the Magic Kingdom and Epcot the predominant color scheme in the Mens rooms is Brown, though in at least some cases I've heard that the womens rooms are Blue (the ones next to City Hall is an instance where I know that the womens room color scheme is Blue and the Mens is brown) does anyone know what the color of this Ticket and Transportation Center south complexes womens rooms are? 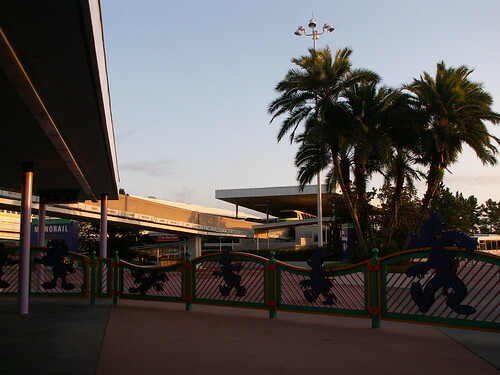 Later in the trip I got the chance to take a nice set of photos of the Ticket and Transportation Center North bathroom and it was obvious they had been much more recently renovated (with a color scheme that I like much better). I made sure to take a photo of the "hand-washing instructions" tile too, Brawny and Sparkle, both products of the Georgia-pacific Corp. sponsor the hand washing stations in the restrooms of WDW, if it is anything like the deal WDW is rumored to have with coke then WDW gets free product, in this case it would likely be hand towels and perhaps toilet paper in exchange for the advertising placement. Upon leaving the restroom I went back outside the gate and took some photos of the monorails to pass the time until they started letting day-guests in. 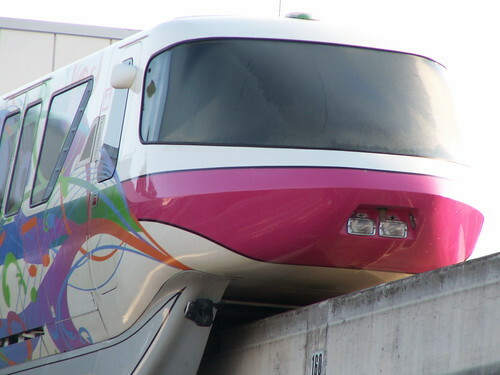 Above: Although I got some good photos of Monorails Green, Gold, and Lime while waiting, this "close up" of pink on the Express loop entering the station may be my favorite of the batch. 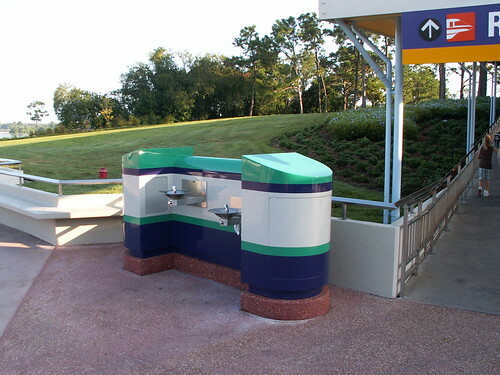 above: When I visited Walt Disney World in June of 2007 there were plywood refurbrishment walls around this area at the base of the ramp down from the monorail station and in a portion of the ferry boat loading area... when I returned in October of 2007 I found these large water fountains that provide nice cold water one in each of those locations, and they are even in the Ticket and Transportation Center colors. Also note how bright the concrete base is (compared to the surrounding slab). Years ago I seem to remember stainless steel models at the Ticket and Transportation Center that may have not had cooling capacity large enough to deal with the massive number of people that pass through this area. I like to alternate between taking the ferry and the monorail to the Magic Kingdom, I don't actually keep track of which I took last, but if the monorail has a line that appears as if it MIGHT fill up I'm likely to head for the ferry, which is what I did this morning, that said, if you are a day guest who wants to catch the morning opening ceremony at the Magic Kingdom I'd go for the monorail because I'm guessing that at least two, and perhaps sometimes three monorails might beat the ferry to the MK. I was pleased to see as I went to board my ferry (The General Joe Potter) that the Richard F Irvine was docked off to one side not in use YET, BUT, I could see a member of it's crew on the upper deck and another in the Wheelhouse preparing it for the new day, and the Irvine was the only ferry I had not yet been on since the portraits of the folks the ferries were named for were added to them, so the fact it was going into service let me know I might be able to do that later. On our way across the lake I got a few nice photos of some of the ships on the water. 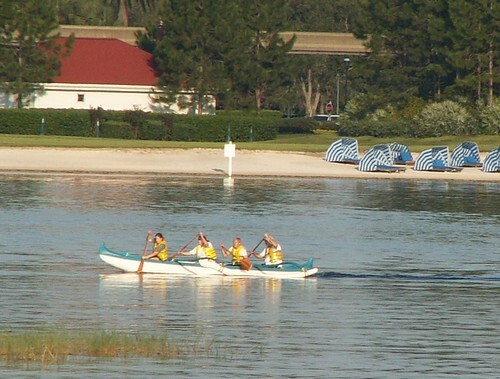 above: On our way across the lagoon I saw one of the outrigger canoes that I had last seen laying on the beach between the Polynesian and the Wedding pavilion actually in use... perhaps these are cast members in training for the annual canoe races? 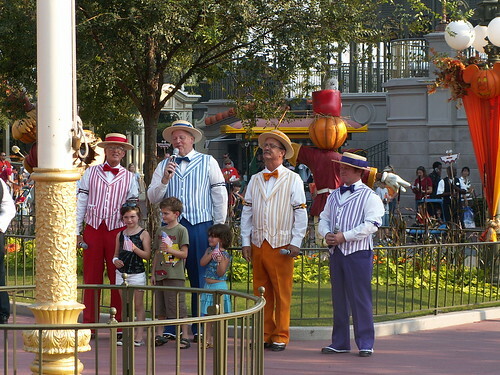 above:Dapper indeed... Neel in red, Kevin in blue (and former conductor of the Voices of Liberty), Ken in purple, and Drew in Orange entertain passing guests. After the Dans set ended I ended up walking back to City Hall I had been hoping for some time, to catch Chief Smokey Miller ever since I had found out that this talented man who had formerly been the emcee of the Diamond Horseshoe Revue, was nowadays found on Main Street in this role, and even sings in this role as well too. 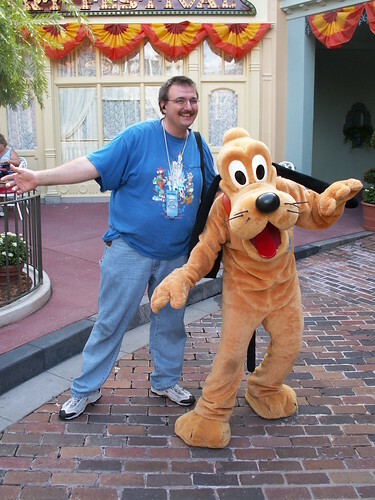 It took some time to get a cast member who could help me, he ended up giving the Main Street Entertainment manager Jeff (whom I had gotten this photo of back in June... http://www.bigbrian-nc.com/2007tr/june/16lg/wdw-06-16-07%20170.jpg) a phone call and Jeff let him know that Chief Miller would not be on the schedule today. It took long enough that by the time I got done it would not be long until the Toontown tuners would be on stage AND the Dapper Dans shortly thereafter so it seemed like a great opportunity to see a bit more of these groups. I still had a little time so I dropped a couple of my postcards I was mailing in the Main Street postal boxes, and took some more pictures of mailboxes, signs, Main Street windows, and East Center Street. 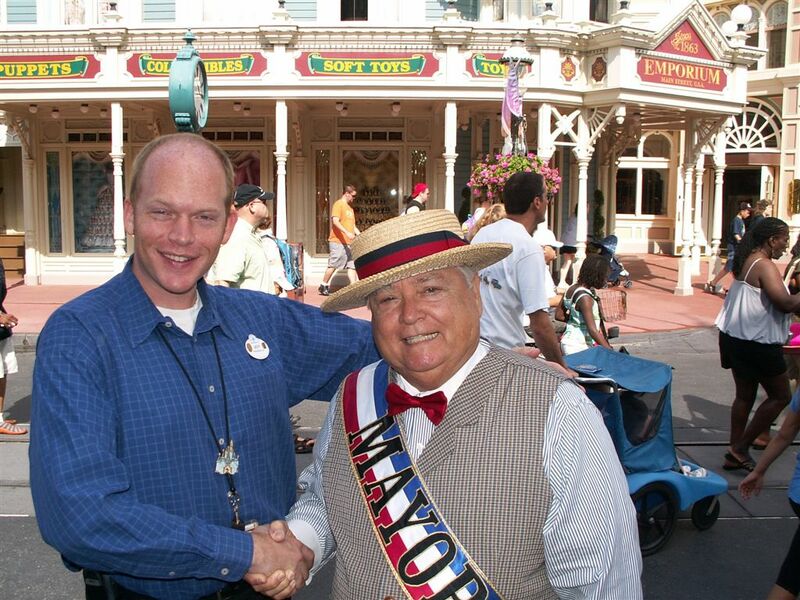 I have never spent much time interacting with the Main Street streetmosphere folks. I actually prefer Streetmosphere sets that are more "scripted" like the skits at the studios, or some of the musical numbers I have (since this trip) seen the Main Street citizens participate in, that said I wonder if I could perhaps "get used to" and eventually prefer the looser unscripted morning activities, the jury is still out on that, but I took a bit of this time to experience this a little, watching the councilman, mayor, and the assistant to the mayor interacting with incoming guests. One very PRACTICAL use of these characters when they are not being used for musical performances is that they can be out interacting with guests even when castle stage shows are going (which was exactly the case when I first saw the Councilman and Mayor this morning) on whereas that might be a tad impractical for the Dapper Dans or the piano men of Caseys Corner. After the Castle Stage show ended the Dapper Dans soon were back out too, though they were short one Dan (Drew), so when a guest walked up who had some barbershop experience they were perhaps even more eager than normal to give him a shot at singing with him and they sang "Wild Irish Rose", after that the Toontown Tuners came out, some of the Dans and some of the main Street citizens tap danced while the tuners performed I just Cant Wait to Be King, then the whole ensemble (tuners, Dans, citizens) did Zip-A Dee-Doo-Dah and Supercalafragilisticexpialidocious as a sing along, encouraging the guests to join in too as they sang and danced. As is normal for mornings on Main Street a kid wearing a Birthday badge walked up and they did Happy Birthday (Sebastian) before going into "When you're smilin'" Which was the last number that was sung (and I think that was mostly just the Mayor). above:After the Tuners played their first few numbers, the lady, who was apparently new to the group, pulled out her sheet music for the next number as she settled it into place one of the guys said "ready" or something like that and she had to tell him to hold on just a bit more, to which the guys all look a bit puzzled until she reached into her pocket and pulled out her glasses which got an "Ahhhhh" from the guys. Note also the purple bag the leader of the group carries, I'm guessing it has little giveaway items for kids like stickers and magic moment certificates and such. Since the Citizens and Dans had been out before the tuners the numbers with singing were done first, then after the Dans and others went off-stage, the Tuners did an instrumental number, Be our Guest, followed up by Happy Birthday (Colin) while it may seem odd that they did Happy Birthday twice I was probably the only person still there from the first time they had done it when they did the second version and besides that it is a short version of it that they do, in fact just after they completed that happy birthday RADPer JD Stearns walked up and we started talking and they ended up singing Happy Birthday one time before they went off stage, as they went off a "trolley show" pulled up though this collection of dancers performing to a pre recorded track of "Magic Wrapped up in Pixie Dust", "Walking right Down the middle of Main Street USA", and "Clang Clang Clang went the Trolley" performed using the Fire engine as their base to perform from making this the third vehicle I've seen used to perform this show (the other two being the Horse Drawn Trolley, and the double-decker bus). I worked my way back to the Main Street Station taking photos along the way I wanted to get a few photos of the train while waiting for the next set of live performances to begin, I decided that the most practical way to do this would be to enter the coral with the other guests who were boarding the train, then after the train pulled in, when the gates opened simply walk around to the exit, well as the train pulled in I looked back down the exit ramp and saw a person who appeared to be a dream Squad member waiting at the "landing" of the ramp, still I did not know what they were giving away or how many, so once I snapped my photos and the folks getting off at Main cleared the platform, when the gates opened I followed my original plan, only now with the possibility in mind that I might either get a prize of some sort, or at least get to perhaps see someone who had one something, as it turned out they were giving away dream fastpasses, and I got one! I got a few photos of the Dream Team members and then started working my way back up Main Street as I got to East Center Street I saw Pluto all alone by himself (as in no guests in line) so I took the opportunity to visit him for a minute. A few minutes later I came upon the Toontown Tuners playing Under the Sea, the councilman was with them, interacting with guests and as they completed that song the Mayor walked up prompting them to play a few bars of Hail To the Chief before launching into Down on old Main Street for which the mayor provided the singing, then there was yet another Happy birthday (Maya), during this set there was actually a castle stage show going on, but with the volume level the sax quartet provide, it didn't really seem to cause a problem and the Mayor and Councilmen continued (mostly the Mayor, but the councilmen chimed in for emphasis) by singing (you've got the cutest little) Baby Face after that the Toontown Tunes went into an instrumental of Belle during which the stage show at the castle finally came to its conclusion since this song has some quieter passages in it I can hear the ending of the stage show a bit in the background of my recording of it. Next up was Supercalifrgilisticexpialidocious during which assistant to the Mayor "Andy" did a verse of the singing in addition to the Mayor. 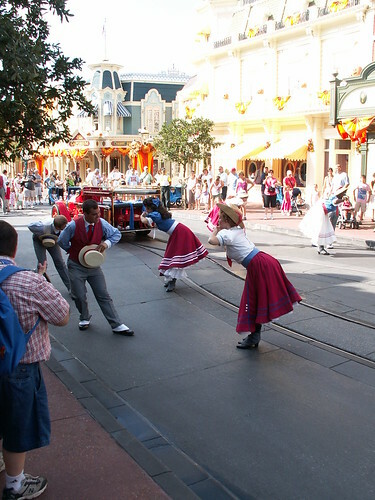 Within a minute or so of that ending, and the Tuners heading in, a trolley show was coming down Main Street, Main Street really stays hopping with entertainment! above: I took this picture in hopes that I would be later able to find out just what was up with the Liberty Square bridge, since then I've heard that years of these wooden pilings in the Florida humidity being crossed by multi-ton parade floats every day has them seriously trying to figure out how to replace it without taking the parade out of service every day. 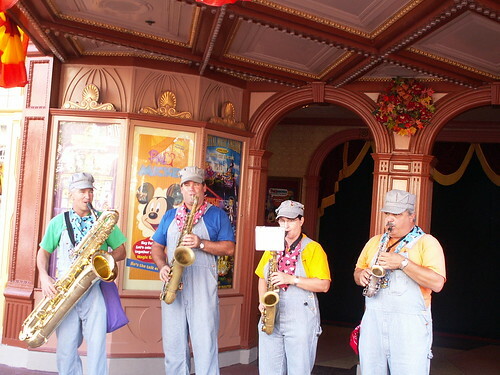 The area near the Dumbo queue was VERY congested and is NOT a great place to record, the saxaphones sound good, but the guy introducing the songs is hard to hear. Continuing to use my live entertainment schedule to plan my day I headed towards Liberty Square, this time I had plenty of time before the Banjo Brothers came out, so I took my time through Fantasyland and Liberty Square just enjoying the sights. In fact when I got to Frontierland a set of Woody's roundup was just starting, so I knew I had the whole time that would run at least before the Banjo brothers came out. I sat down near the show but behind most of the crowd and took care of some minor business like changing batteries in the camera (requiring resetting the time too) and touching base with my wife to see if she had been able to check in early and take a nap like I knew she wanted to she was checked in, but when I inquired about the nap I lost the call, apparently she had been trying to call me though and so I looked through the phones settings and saw the ringer had been turned off and fixed that (just to vibrate though I'd hate for it to ring while I was recording something). After the roundup I headed over to the porch of the Diamond Horseshoe which is where the Notorious Banjo Brothers and Bob typically come out. 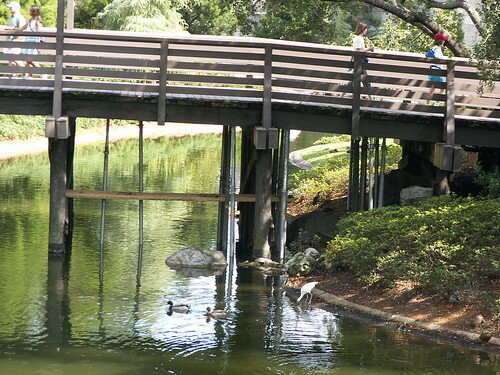 They performed the songs of this set over on the Mainland dock for the rafts that go over to Tom Sawyers Island, keeping the guests waiting for the next raft entertained. 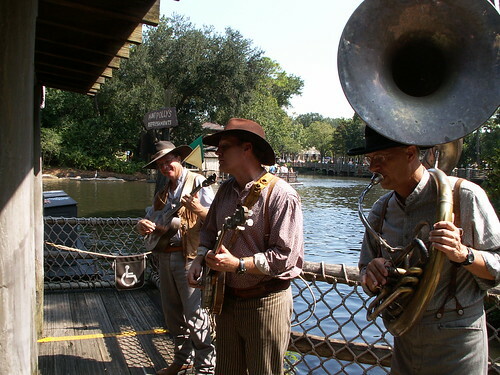 Just as the Banjo Brothers were marching off-stage the "in just a few minutes" announcement came over the loudspeakers for the NEXT Woody's Roundup, so even in Frontierland they keep the schedule pretty full with various live entertainment. I decided to use some of my dream fastpass tabs now I hit the Jungle Cruise, our boats skipper was ok, not great, he seemed like he had enough enthusiasm, it must be challenging to keep delivering those lines over and over though. After that I took the opportunity to enjoy my favorite Magic Kingdom attraction Splash Mountain, it was less than 20 minutes between the last photo I took on the Jungle Cruise and the first one I took on Splash Mountain, I suspect it was more like 10 minutes from getting off one boat to boarding the next. I then hopped on a train at the Frontierland station. 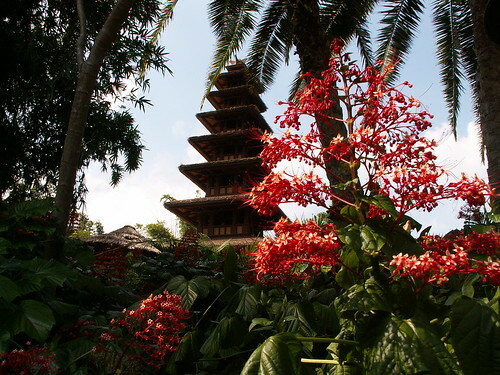 From the Frontierland station I could see some guys in hard hats up the track working on Big Thunder. 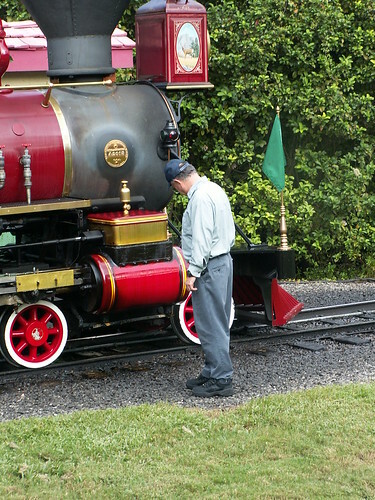 I got off at the Toontown Country Fair to take some pictures of the engine. I was getting a bit hungry by this point (it was about 3:50) so I dropped in at Cosmic Rays Starlight Cafe where I had the Chicken Caesar Salad, Large Coke, and a brownie $12.75 although I enjoy Sonny Eclipse I was more attracted to the almost empty dining area overlooking the castle, it was a nice meal and I even got to talk a bit with the cast member who was cleaning the area. I took my time eating and by the time I got done it was getting close to 4:30 and I headed towards town square to catch the flag retreat ceremony, I had attempted to record it in June, but it was some of the audio from that first day of the trip that I lost and this time once again I seem to have messed up in attempting to record it go figure. Still it's hard to be to awfully upset about it with all the rest of the stuff I recorded this day. 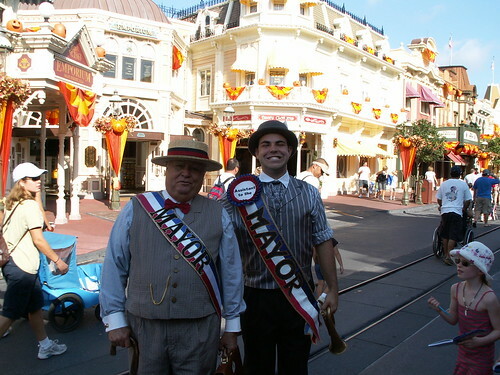 above: Neel, Kevin, Dan, and Ken at the flag retreat ceremony, backed by the Main Street Philharmonic. After flag retreat I believe I went and caught Jims last set, as I remember being over there by the piano after folks had started coming in for the party and hearing him play a bit of Following the Leader when we saw a whole family dressed as the characters from Peter Pan, the Dad was dressed as Smee, the son as Peter, Mom as Wendy daughter as Tigerlilly and a little baby as Tinkerbell. (but unfortunately that was part of the audio I lost from this evening too.) I decided to hit a few more attractions Monsters Inc. Laugh Floor was a new attraction for me so I wanted to make sure and catch it, I enjoyed it, but for some reason I missed recording it too, I have a few minutes in the queue recorded but I think perhaps at this point, missing the flag retreat and the Laugh floor, perhaps my battery was going dead and I was just a bit slow to catch on as my own personal battery was wearing down a bit as well, by this point in the day. I enjoyed the Laugh Floor and followed it up with a "spin" on the Buzz Lightyear attraction. 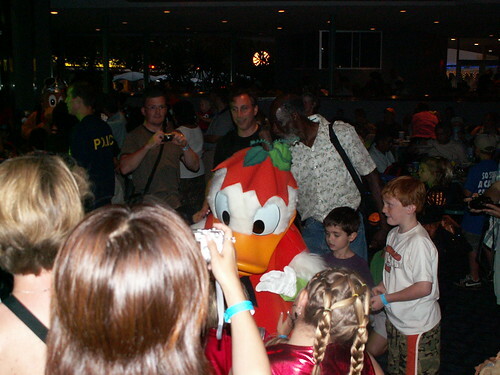 By this time it was closing in rapidly on 7PM I walked through cosmic Rays to get a glimpse of the party in there, there was a a DJ and a throng of people around the stage I contented myself with getting a few quick shots of the Characters in costume from a distance (Elvis Stitch, Aviator Pluto, and Pumpkin Donald) before heading on my way. 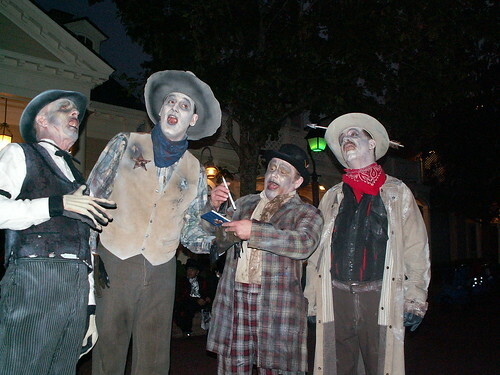 One of the frustrations of this party in recent years for me has been the lack of availability of a live entertainment schedule, the party has changed over the years, when I had last attended it, in 2002, there was s how at the Diamond Horseshoe that featured some of the Horseshoes normal performers and the "Cadaver Dans", an undead, Frontierland version of the Dapper Dans. There was also a Riverboat Cruise that featured a storyteller named Auntie Bellum, and the Lone Strangers Trio (who bear a striking resemblance to the Notorious Banjo Brothers and Bob). I belive the Lone strangers still perform a set early in the night at the front of the park as folks are coming in, but the Riverboat no longer cruises during the party, and with no "regular show" in the Horseshoe the Dans are relegated to strolling Liberty Square to perform their sets. Still I had some hopes for this party as there were also some new entertainments I had heard would be performing this year, there was a performer on the lawn of the Haunted Mansion named Madame Carlotta, a Pirate Band in Caribbean Plaza, and a ghostly apparition on the riverboat. Well with the riverboat parked I pretty much guessed that the apparition was one of those things I would not worry too much about catching as it was probably just a matter of "there's something moving around over there" kind of thing. I knew I wanted to try to catch the Pirate Band and the Dans though, I ran into the Dans on my first trip round through Liberty Square, just in time to catch the last song of a set Ghost Riders in the Sky and got to ask them about the rest of their sets and if they knew anything about the live entertainment, they mentioned the acts I listed above and the fact that the previous year there had also been a Merlin (played by the guy who used to play Professor Terrance at the Horseshoe, and who currently plays Blackjack Dupree at the Pirate and Princess Parties, and Jack Diamond at the Disney's Hollywood Studios) but they weren't sure if he was still doing that this year (I found out later he was not). I headed over to Caribbean Plaza to see if the pirate band was out they were not, so, passing through the hub where a castle stage show of some sort was going on I headed over to see if the Merlin fellow was out at the stage where Belle normally has her story time session, but this year it appears they were using it as a meet and greet location for Cinderella's Step sisters. 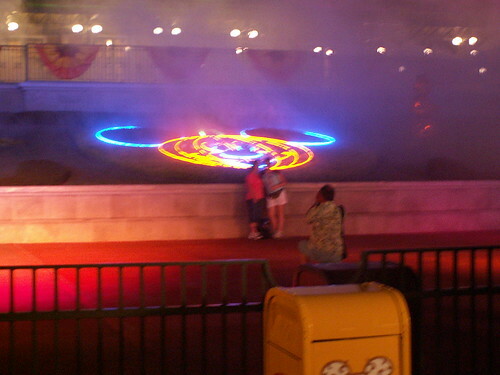 I circled around towards the Mansion stopping to get some candy in a short line in Liberty Square. I wasn't exactly sure where to look for Madame Carlotta but seeing nothing obvious on this pass headed around again to Adventureland to see if the pirate band was out. on my next trip back to the Mansion I saw a Cast member out front and found out that she performs on the lawn, and I had just missed her. I went and got a bit more candy this time at the station at the riverboat the line was a bit longer but it moved really fast. Coming out of there I heard the Cadaver Dans entertaining the folks gathering along the parade route since they were doing their pre-parade routine of doing a song or two and moving a bit father up the route to entertain some more folks I didn't try to get too close but instead hung back where it was easier to move as they moved. Above: after the fireworks we gathered for a group photo. I had been considering just leaving after the meet, but I was recharged enough following the meet to go ahead and check Adventureland one more time, to see if the pirate band was out. 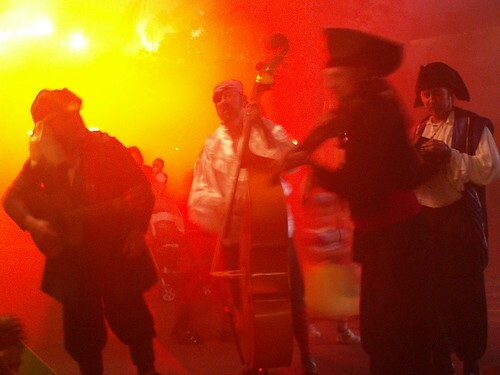 I found them and they were interacting with a couple of guests, who themselves were wearing some pirate type costumes and dancing with the band so it was hard to know just who was in the band at first. Just a few guests, and I was afraid that perhaps they were near the end of their set and most of the crowd had drifted off, but it turned out they were just starting They seemed to flow from one song to the next at first going from sailors hornpipe to Til jack comes home again and then quickly into Yo ho, yo Ho A Pirates Life For Me after that since I thought they were nearing the end of their set I asked them about their set times, the other band members dropped into a little background music instrumental as he talked to all the guests coming up after a few moments I realized it was the Theme from "the Munsters" as a whole new crowd had begun to gather, and the only couple who had been with them when I first walked up had gone on their way, they dropped into basically the same songs I listed above only this time I was close up to record them, their name is The Kings of the High Seas they had a big basket of rattles and various percussion instruments and were encouraging guests to grab them and join in. As they sang yo ho ho and a bottle of Rum they strolled as if going off stage but after popping into the nearest line for candy and coming out I found them playing a Jimmy Buffet song Jamaica Farewell I'm guessing the folks walked up and requested it after the rest of us left, after that they did head off and so did I, happy to have at least caught this Pirate Band (and a nice length of set at that) I decided to try one more time to see if I could catch Madame Carlotta, but it was too close to the time for the second parade I would have had to go to Main Street to be far enough ahead of the parade to cross, so satisfied with the nice ending to the day the RADP meet and the Kings of the Hight Seas had given me I decided to just head for the exit. If you recall WAAAY back at the beginning of this day I had noted that the ferry Richard F Irvine was in service and I was hoping I might finally catch a ride on it this trip Well on the way back to the Ticket and Transportation Center I did and I got some photos of the Irvine portrait including some of the little plaque at the bottom so I could transcribe it as I have done for the others. 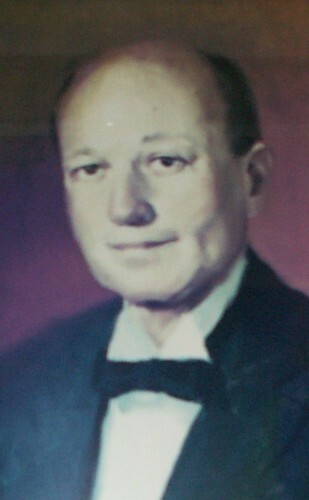 Walt Disney World until his retirement in 1973.